Context: Bought this for my grandmother for Christmas but, having listened to it, decided against giving it to her. She’s not much of a fan of orgies. Perfume is worn by people to deceive others into thinking they are what they are not. This is, essentially, the premise of Suskind’s work despite him not stating this anywhere in this creepy novel. From the very start, we are thrown into a moral dilemma common to mankind: can we accept things as they are or must we, with perfume appropriate to the occasion, sweeten them to suit our own sensibilities? The book begins with a Dickensian portrayal of Paris sensed, not with the eyes, but with the nose. From this emerges the protagonist Grenouille about whom you feel little sympathy and have less liking for. He’s scorned by everyone and Suskind writes so that you too also fall prey to this temptation. By the time Grenouille evolves into the ‘murderer’ of the title, you realise you’re dealing with an amoral being. Still, this doesn’t stop you placing him firmly somewhere within your own morality and condemning his behaviour and his scorn of society. In some insidious way that I wasn’t particularly comfortable with, Suskind makes you feel guilty for doing this. This is no more apparent than in the final scenes of the novel where morality is turned on its head and the novel comes to a screeching halt in a kind of perverted pile-up of reasoning. It’s all a little disturbing which is absolutely fine. 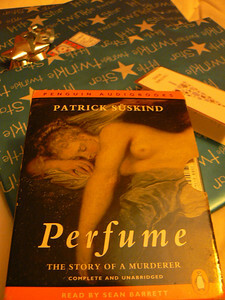 The trouble is, I came away wondering what exactly Suskind was trying to disturb and, more’s the point, why. For me the novel came very close to being excellent. Had it not been for the lack of clarity that I felt in the latter half of the novel, I’d rate it higher. In eighteenth century France there lived a man who was one of the most gifted and abominable personages in an era that knew no lack of gifted and abominable personages. For the first time they had done something out of love. Thank you very much for linking to me. I quite enjoyed your review. Though I disagree slightly (but only because I love morbidly disgusting novels, as long as they are done well), I find your points very eloquently stated. Thanks for linking to me, though, to me, the morbidly disgusting was over done. Felt like Suskind was hitting me on the head with it. Perfume is about obsession passion and blind indulgence born out of deep yearning the yearning to find oneself in the scheme of world and it elements, the search for the real meaning of existence and the fulfillment in it which is universal and often subdued. Here the protagonist searches himself, his glory in realms physical or material but at the height of his professional success finds out that he is still lacking and is far behind. To his utter disappointment he discovers that artificial is never a replacement for the natural. Perfume is a deception and never an alternate to the real fragrance of authentic personality or existence. My perception is that he would have never allowed himself his to his dismal end had he was born in east, but would have turned spiritual.